Swimming in debt isn’t fun but drowning in debt can be a nightmare. Are you swimming in debt and don’t know how you’re going to pay it off? You’re not alone. Did you know the average American household is $132,086 in debt? Whether you just fell in debt or are still struggling to pay off the debt load you’ve acquired, you need to get focused and get rid of it. Following these points will relieve you from debt. 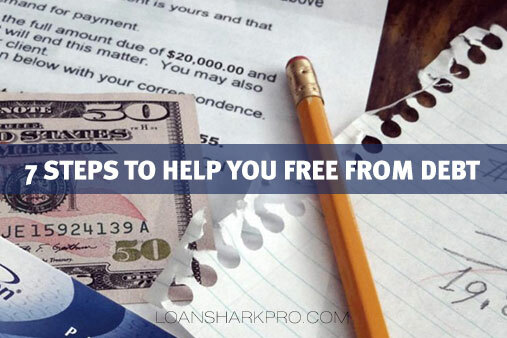 Sticking to these strategies will keep you from having to know how a cash advance works and debt free in the future. The expensive debt from your list in highest to lowest manner and tackle it by paying the one with highest balance or interest rate first. For instance, by paying off the balance with the highest interest first, you increase your payment on the credit card with the highest annual percentage rate and continue to make the minimum payment on the rest of your credit cards and thus quickly clearing up your debt load. Weaken your debt by paying more or say at least double the minimum payment due amount. This will help to prevent extra interest charges and trim down that balance faster. If it’s too difficult to pay with one paycheck, than you can increase the frequency of your payments by paying the minimum payment every two weeks so that will still bring down the balance. If you have a high interest card and it has a balance you think you can pay off in a small period of time, then transfer that amount to a zero or low interest credit card. It will help if you can make large payments on your low interest card and cut down high interest debt. If you do it right, you can save a lot on interest. Have you received any job bonus during the year? Don’t be enticed to spend them off on any unnecessary big purchases or any last minute road trip, use it to pay off your debt. It’s worth more to fix your financial situation than buying an expensive watch and insensibly stretching your span of debt. Try to cut out some of your monthly expenses which you can easily remove or eliminate. Consider what you really need, you can exclude things like television cable service, a gym membership, coffee or eating out or entertainment costs. You should also be aware of your impulsive shopping habits. Knocking out those extra expenses could save you lot of money to pay off your debt quickly, if you are truly committed. Do you have any old unused gifts or any unwanted items which are collecting dust and occupying space? If you don’t need all that stuff, sell it as soon as possible. Any profits from those sales should go toward your debt or any Las Vegas signature loans and upgrade your life when you are finally living debt-free. Your routines and habits are the reason you got into this mess. Create a budget, think about how you spend money each day throughout the month to get an insight of your expenses. Budgets really do help to control your overspending and you can see areas where you can save money to pay down debt instead. Set some money boundaries and reshape your spending habit. Lying on a bed of debt won’t provide you with relaxed sleep. If you’re drowning in debt and need to come up for air, apply these habits and get focused. You will see a difference in only a few months.